Make 4 payments of $3.03 over 8 weeks and get it now! If only the best is good enough for your dogs, then you need to know about OraVet Chews. So why do veterinary dental specialists recommend the OraVet dental hygiene chews for dogs? 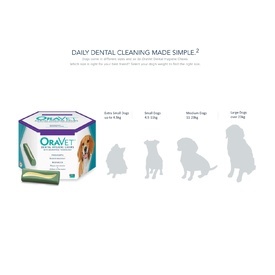 OraVet dental hygiene chews work by disrupting the formation of plaque, so that it no longer sticks to the dog's teeth, and if plaque is left in contact with the tooth surface for more than three days, it hardens into tartar. It is the combination of bacteria-laden plaque and mineralised tartar, that inflames gums and causes bad breath. It eventually leads to gum recession and tooth loss in dogs. Plaque is a bio-film. In other words, it’s a sticky substance made up of bacteria and organic slime. Dog plaque removal is particularly important because plaque acts as a shield for bacteria, protecting them from antibiotics and disinfectants. The delmopinol in OraVet dental hygiene chews disrupts plaque, reduces plaque formation and makes bacteria susceptible to attack. 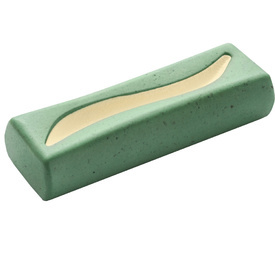 Add this to the mechanical action of chewing on a mildly abrasive chew, and you get pretty close to the ideal action of brushing dogs’ teeth. Unlike many other dental chews, there is research data to compare the difference that OraVet dental hygiene chews make to your dog’s teeth, gums, and breath. OraVet chews come in a variety of sizes, appropriate for different types of dog. To choose the right OraVet chew for your pet, go by their weight category. Also available in packs of 3. 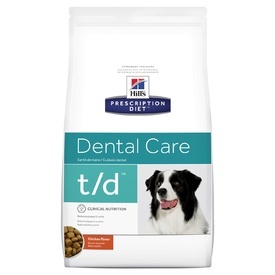 They carry the VOHC (Veterinary Oral Health Council) seal of approval. 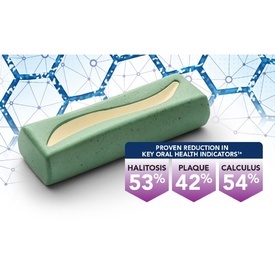 OraVet dental hygiene chews are made by Merial. It is a drug company also famous for making Frontline, a truly effective flea spot-on. OraVet chews alone hold the veterinary patent to delmopinol, a substance proven effective in human mouthwashes. Plaque (the sludgy coating that is the precursor to tartar) formation on dog’s teeth was reduced by 50%. Tartar (the hard yellow-brown coating) formation was reduced by 50%. Remember, these results were obtained with just one chew per day! The OraVet Dental Hygiene Chews carry VOHC seal of approval and are recommended by vets. Dogs love the flavor and texture of these chews. So these are an excellent choice for fussy dogs. Super effective in reducing bad dog breath, so very popular among dog owners. Great for routine dog dental care in between teeth cleaning sessions at the vet. These chews must be chewed by your dog, not just swallowed, so please make sure you choose a large enough size. OraVet chews can cause vomiting and diarrhea in dogs with sensitive stomach. 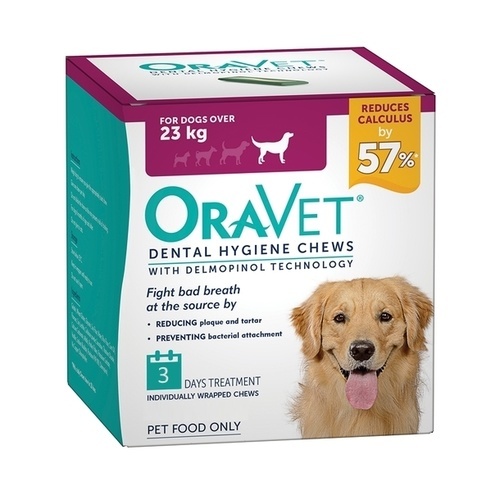 Oravet Chews are for dogs over 6 months. 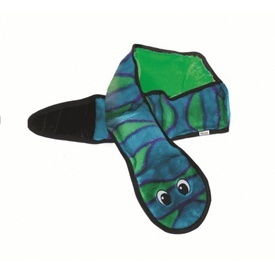 Invincibles Snake Squeaker Dog Toy Blue/Green - New Colours!